Hello friends! 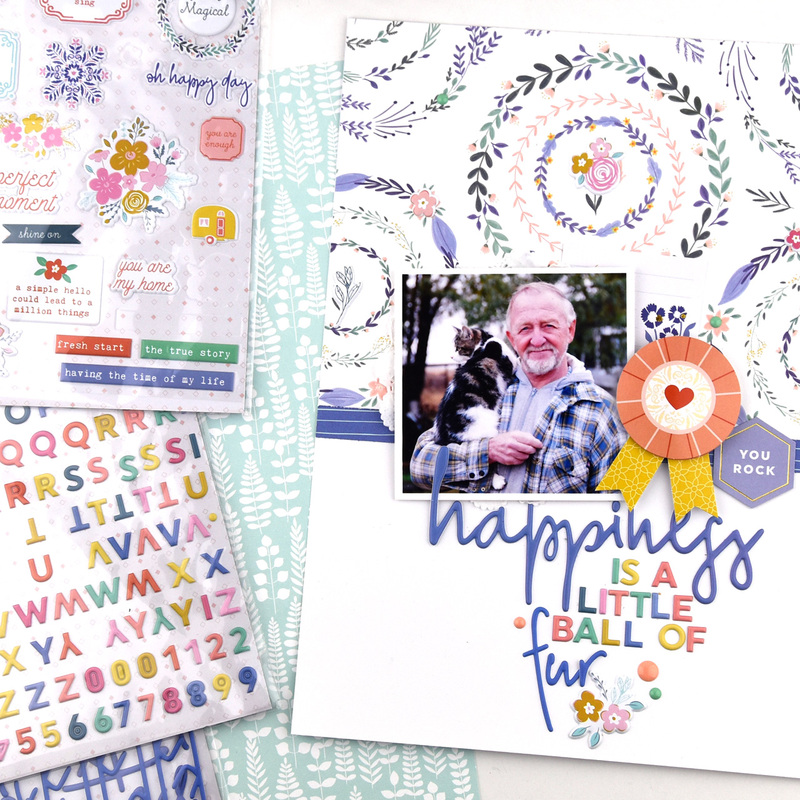 I have two projects to share with you today using the gorgeous Joyful Day collection by Pinkfresh Studio! 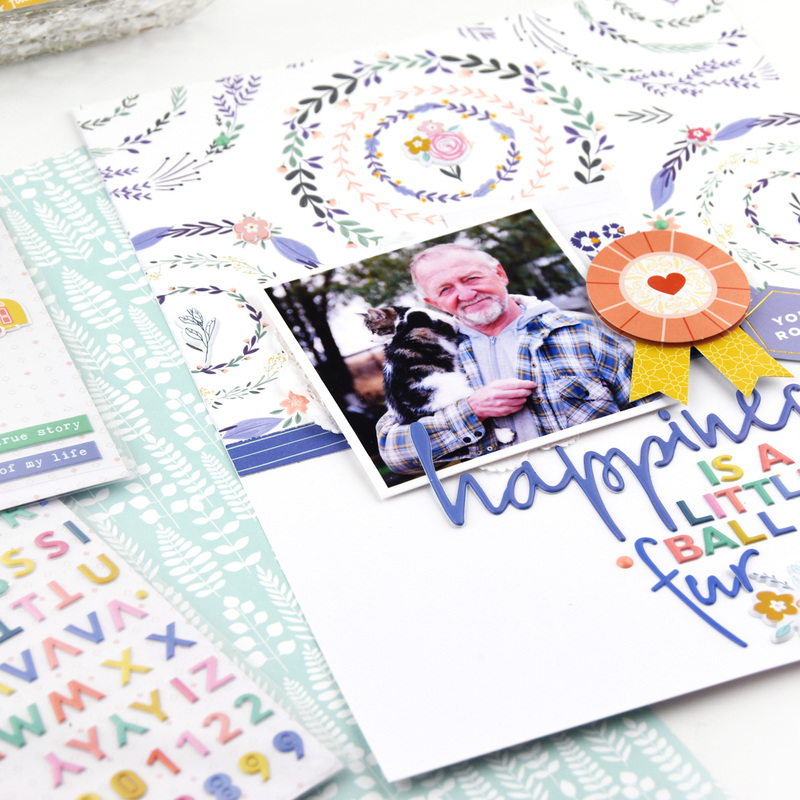 I adore the colors and theme of Joyful Day, and I found it easy to use and was so happy with the way my projects turned out so colorful and cheery! 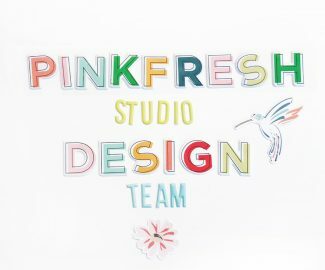 You can find the Joyful Day details here on the Pinkfresh site! My first project is a 6×8 layout. It was super fun to try this size, and the design would easily translate to 8.5×11 or 12×12. I used the Big Ideas paper for my main focal point at the top of the page. I love the delicate wreaths on this paper. 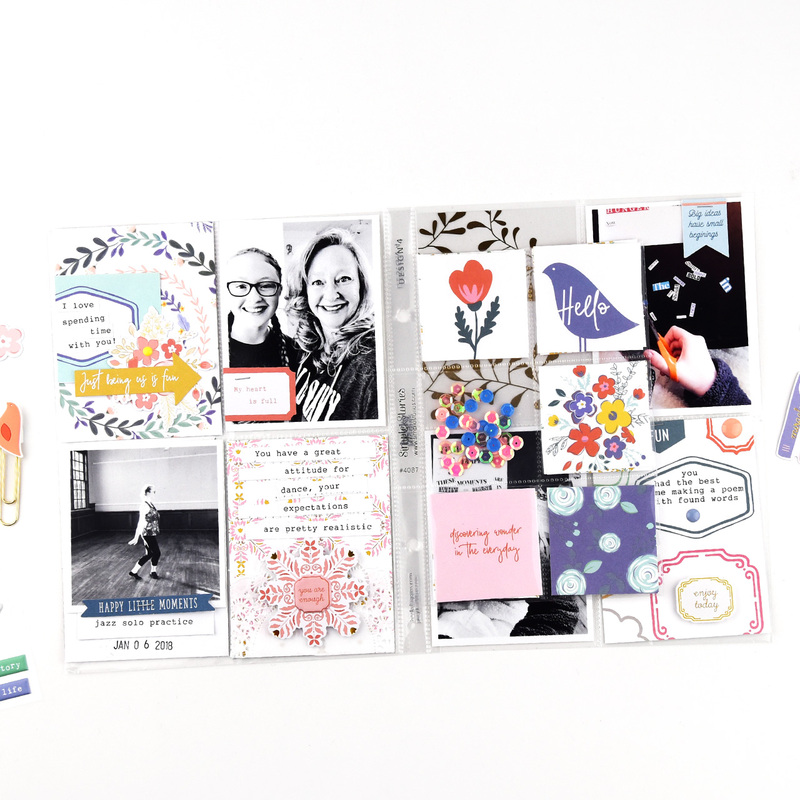 I added a strip of the Fresh Start paper for a pop of brilliant blue and to make a spot for my photo. I used a 3×3 photo and placed it over the spot where my papers met the white background. I had trouble deciding on my main embellishments as almost everything looked great! 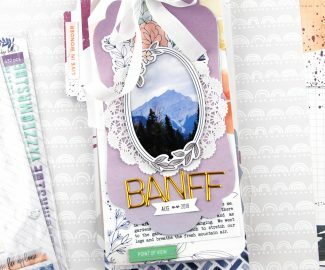 I finally decided on the sweet layered prize banner, and it fit perfectly by my photo and helped to carry the round theme from the wreath paper. I added the You Rock label from the cardstock sticker sheet to continue with my blue color in this area. Next up was my title. 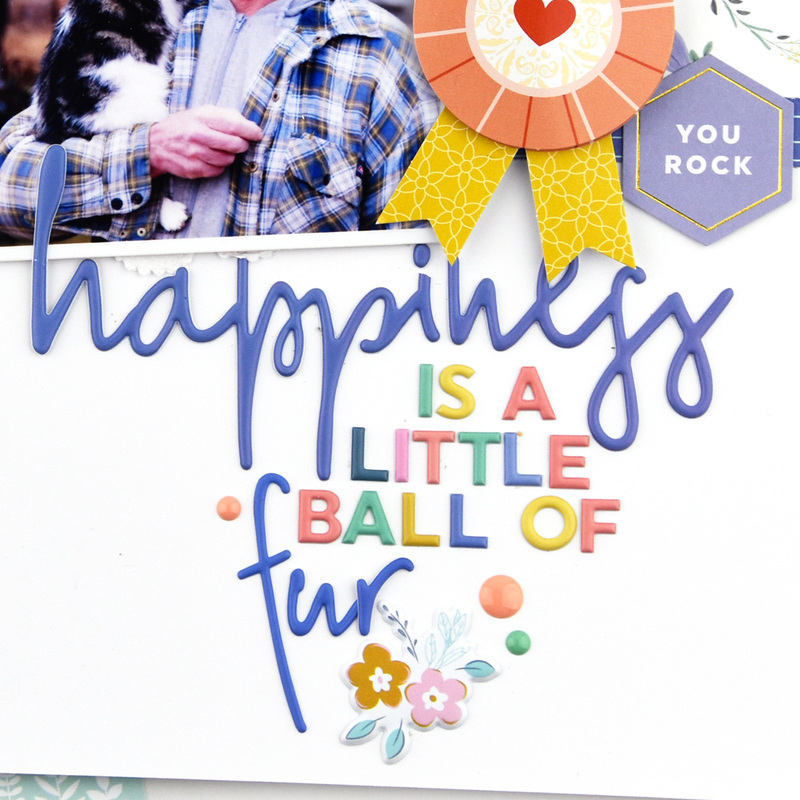 I had to use one of the Puffy Phrases and chose happiness; the size and color was a perfect fit for my photo and cluster area! My Dad is a Big Bang Theory fan, so I used a portion of Sheldon’s Happy kitty song for the rest of my title. I used the Mini Puffy Alphabet in assorted colors and then finished off with the Puffy Alphabet in the blue script font. I love that I was able to mix the phrases and alphabets so easily and make such a cute title! I finished off the layout with Puffy Stickers and enamel dots from the Mixed Embellishment Pack. They were just the right little additions to give more detail to my page! I even sprinkled a few puffy stickers onto the wreath paper background! 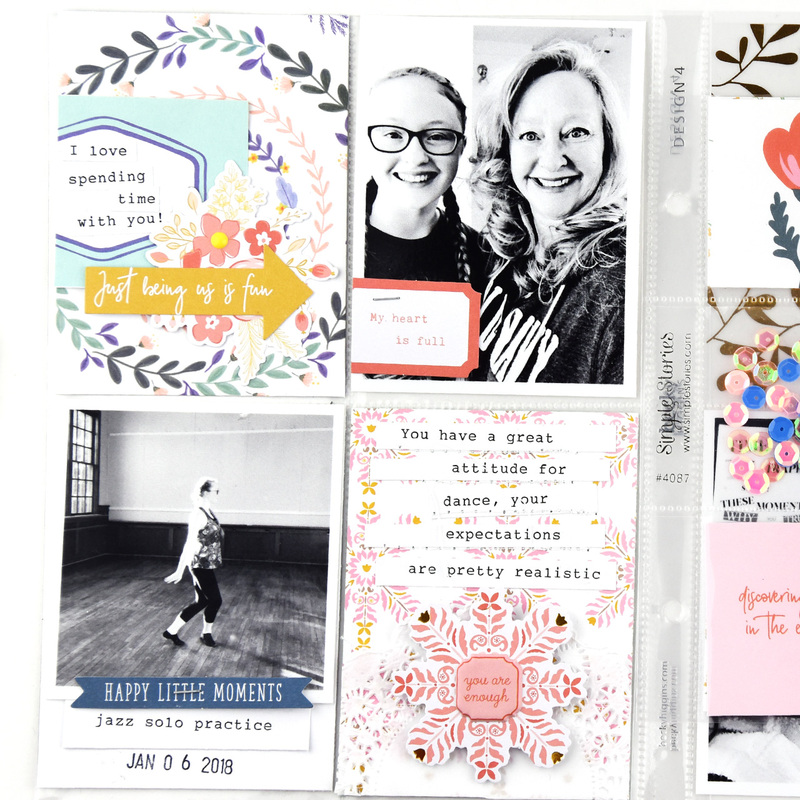 My next project is a Pocket Page spread using Joyful Day. 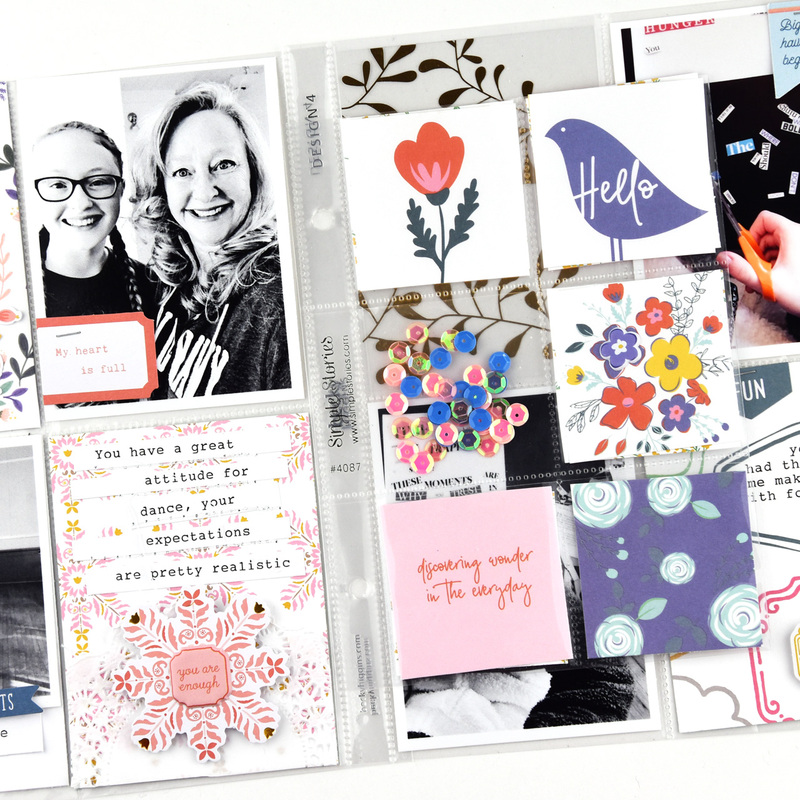 I started by adding my photos to the pockets so I would know where to fill in space with pretty goodies! 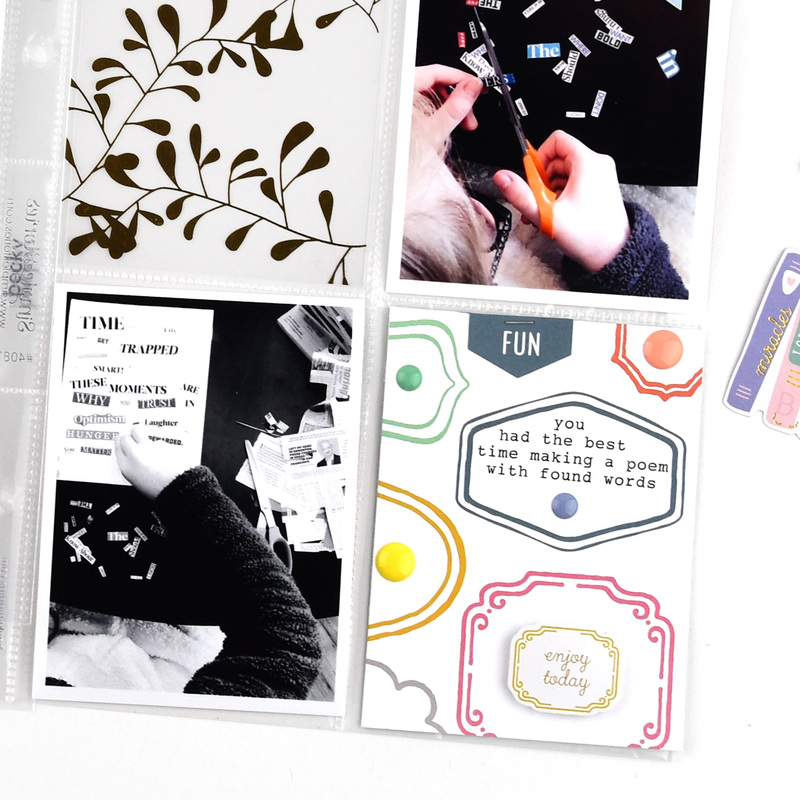 I made 3×4 cards from the Big Ideas, Perfect Moments and True Story papers. I also used a gold foil acetate card from the Everyday Musings Pocket Card pack. 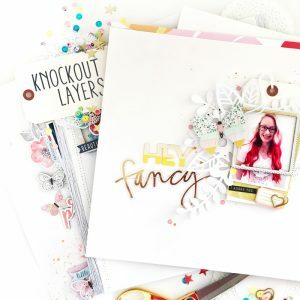 I had so much fun picking out pieces to decorate my cards and photos. 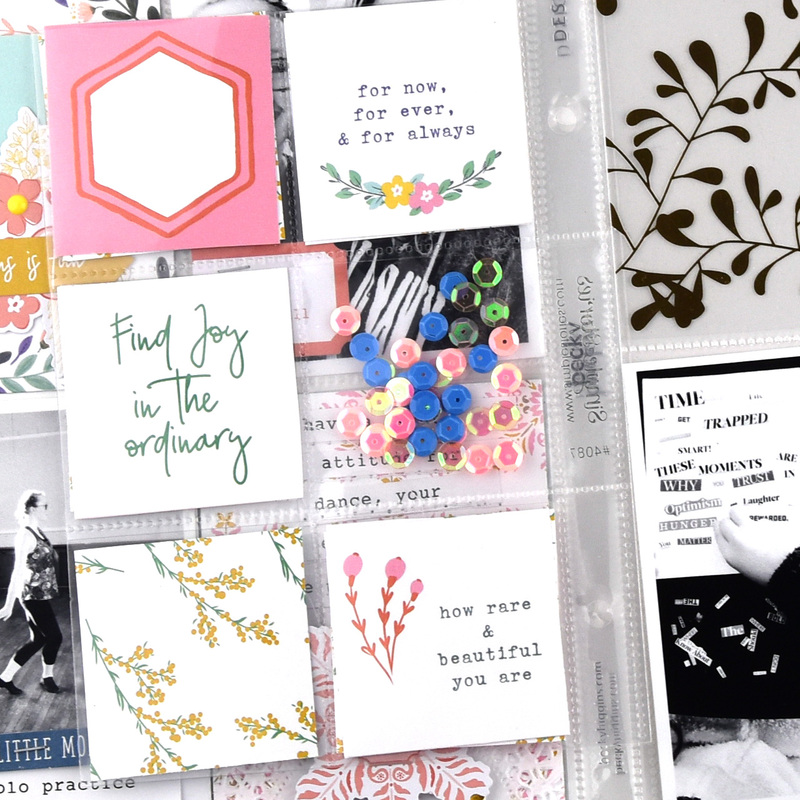 I layered a 2×2 square with my typed journaling and a cute floral and arrow from the Joyful Day Ephemera Pack onto the top card. I used the ephemera piece that co-ordinated with the True Story paper on the bottom card and popped a puffy sticker into the center! 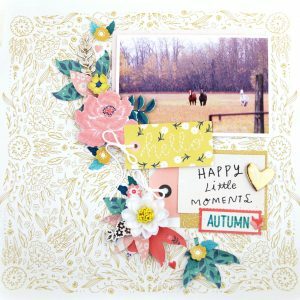 The 2×2 squares from the Simple Pleasures paper were a fantastic resource for my pages! 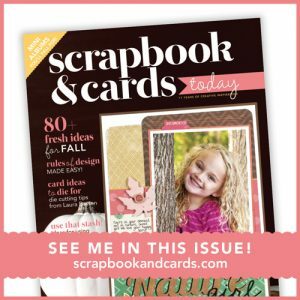 I cut down a pocket page for an insert and added 2×2 squares front and back. I added a mix of sequins from my stash for a little sparkle! 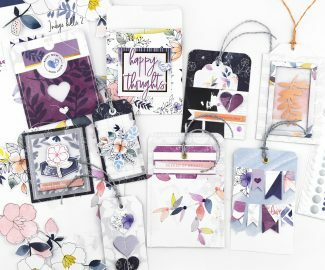 I think the hello bird and floral square are my favorites! Many of the 2×2 cards have such sweet sentiments! My last card uses the Perfect Moments paper with all the labels. I ran the card through my typewriter and then added some enamel dots, and a layered enjoy today sticker from the Mixed Embellishment Pack. The cute little “fun” arrow fit perfectly at the top of the card, so I added it on with a staple. Thanks so much for having a look at my projects today! 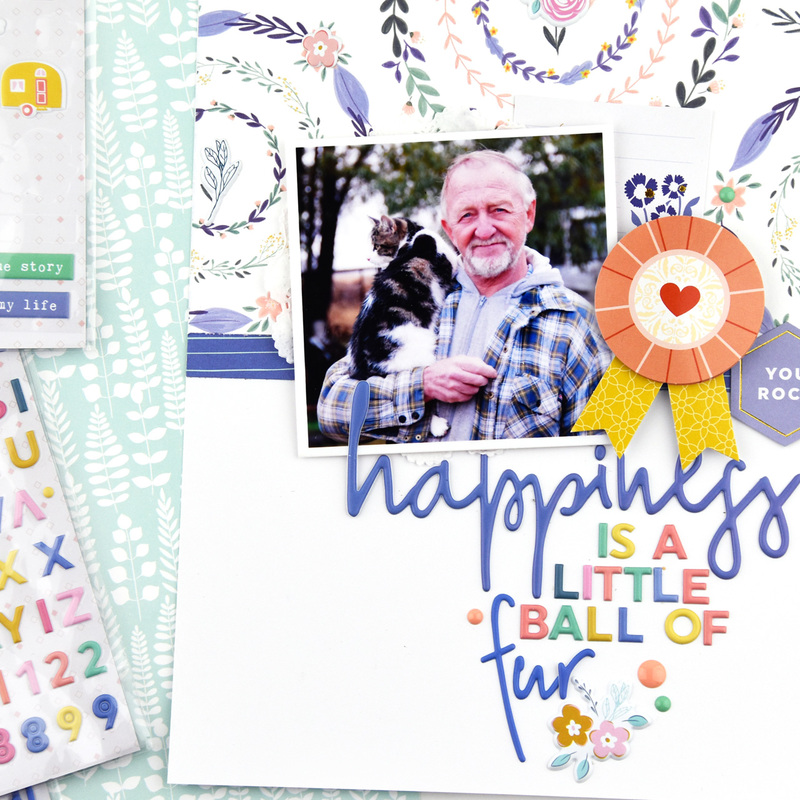 Joyful Day is such a lovely collection and adds such color and happiness to any project!